CRM makes building customer relationships seamless. We know the value of good relationships. At Springboard, we built our POS with easy-to-use customer relationship management features to help your team do what they do best: make customers happy. Collect the data that is relevant to your retail business. Our SmartFields give you flexibility. Go mobile. Check a customer's dashboard, see their history and make smart recommendations. Get a holistic view of your customers across all your channels. Engage with them intelligently. Keep your customers coming back with gift cards, built in coupons and promotions as well as Thirdshelf Loyalty. Our CRM for retail gives you tools to build thoughtful relationships. Did you know, it's much more expensive to acquire a new customer than to retain a current customer? Providing customers with highly personalized experiences continues to be a key retail trend. We give you the means to get to know your customers, understand their habits, needs, and preferences without costly retail CRM software. Our custom fields allow you to get as granular as you'd like and create custom CRM views for your customer dashboard. See your customer's activity across all channels; use this data to market strategically keeping them coming back time and again. You know your retail business best! We want to give you the power to collect whatever data you think is relevant. Create any field you want with our SmartFields. Multi-store or omnichannel? See your customer's history across all channels and get a complete view of their interaction with your brand. Get the data you need to close the sale – quick and easy with the click of a button. 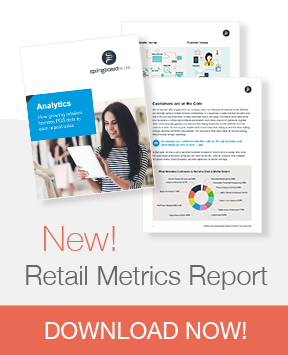 Empower your organization to use customer data to personalize store experiences. We know you need tools to keep your customers coming back. Whether they're a Millennial or a Baby Boomer you can reach them in whatever way captures their attention. See more of Springboard's powerful POS features.